What are the high performance construction materials? Unlike the artist, who interacts directly with his or her palette, the architect is one-step removed from the physical substance that makes architecture. This synapse often breeds ignorance about what materials are available or what properties they possess, which is reinforced by the fact that relatively conventional products and systems still comprise most buildings despite the wide variety available. Indeed, when one assesses the diverse and fantastic range of materials available today, one realizes the extent to which humanity has been hell-bent for innovation. One sees not a fixed catalog of products, but rather a constantly shifting array of materials which offer continual improvements upon known standards or which render those standards obsolete. 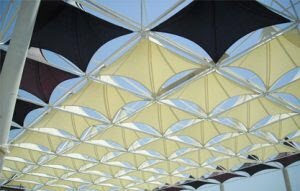 Tension fabric structures are appropriate for use in entertainment venues, special events, exhibits & trade shows, or anywhere that fabric architecture is suitable. Made of nylon spandex, the structures offer a viable surface for any projection or lighting display, including front and rear projected video. It is also possible to print on the fabric via silk-screening or dye sublimation digital printing. The perforated Geo-web cellular confinement system features an engineered pattern of perforations in the cell wall. This hole pattern provides an increased frictional interlock with coarse aggregates, crushed rock, and concrete. In vegetated systems, the apertures increase root lock-up, creating a more stable vegetated mass and overall healthier soil environment. The perforations allow lateral drainage through the system, thereby enhancing the performance of the system in saturated soil conditions. 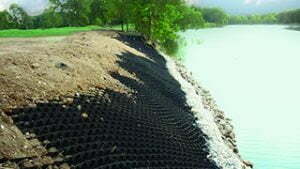 The Geo-web system improves system performance in slope and channel protection, earth retention and loads support applications. Ethylene tetrafluoroethylene (ETFE) is a fluorine-based plastic. It was designed to have high corrosion resistance and strength over a wide temperature range. 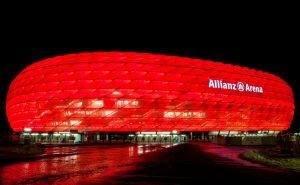 ETFE is a polymer. 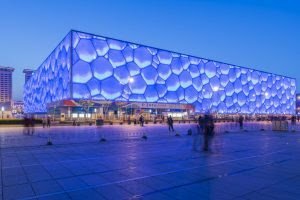 An example of its use is as pneumatic panels to cover the outside of the football stadium Allianz Arena or the Beijing National Aquatics Center. The panels of the Eden Project are also made from ETFE, and the Tropical Islands have a 20,000 m² window made from this translucent material. Aerogel or “Air-glass” is a transparent material that looks like glass, insulates better than mineral wool and is more heat resistant than aluminum. The material has many exciting properties and possible applications such as insulation in windows and solar collectors, windows in firewalls, a component in air-conditioning equipment, etc. Aerogel has outstanding features, especially regarding heat transfer. Aerogel is molded, giving the possibility of getting different shapes: cylinders, cubes, plates of varying thickness, etc. Chemically, Aerogel is composed of quartz and a great deal of air, making it fragile. Ply is a wall panel consisting of a solid wood frame with an undulating birch veneer of 0.4- mm-thick plywood. This new material is so thin that it folds nearly as quickly as fabric. 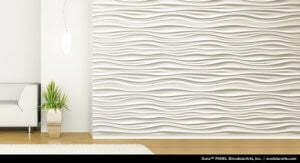 Thanks to the wavy surface, the element absorbs sound well. Still in development is a version with built-in lighting and panels thin enough to let light pass through. 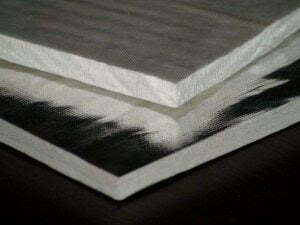 PanelsGroups with an extra backing of sound-absorbing material are another option. The smart-beam are suited for long-span composite floor construction or long-span roof applications for architecturally exposed steel. Produced with castellated, hexagonal web openings or cellular, circular web openings, smart-beams operate most efficiently between 30 and 80- foot spans. Smart-beams allow a more flexible, column-free, long-span floor space at the same cost as traditional short-span construction. 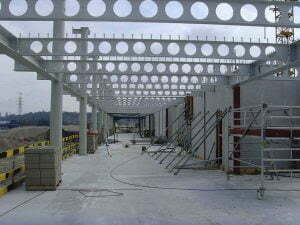 The most common building types for smart-beams are office buildings, mezzanines, parking garages, or any application utilizing a suspended composite floor. Smart-beams’ superior vibration characteristics and ability to accommodate mechanical services make them ideal for any composite floor application. “Light-as-air, stronger-than-steel materials are just beginning to shape our world. Ten times stronger than traditional aluminum at just one-tenth the weigh. 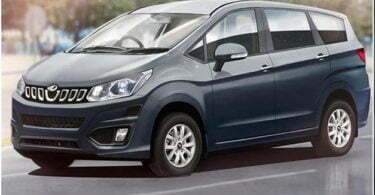 Its isotropic cellular structure helps the frame absorb shock and serves as an insulating firewall. 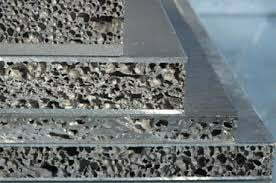 The foaming process can also be applied to steel, lead, tin, and zinc. The product is a high strength, extremely lightweight material that possesses high durability, excellent finish, and lasting value. 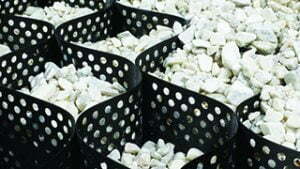 Roadway pavement is a cement-based concrete product that has a porous structure which allows rainwater to pass directly through the pavement and into the soil naturally. 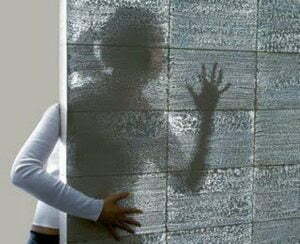 This porosity is achieved without compromising the strength, durability, or integrity of the concrete structure itself. The pavement is comprised of a special blend of Portland Cement, coarse aggregate rock, and water. 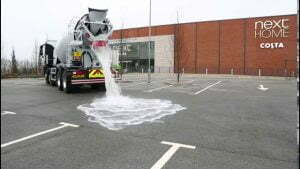 Once dried, the pavement has a porous texture that allows water to drain through it at the rate of 8 to 12 gallons per minute per square foot. A Hungarian architect has combined the world’s most popular building material with optical fiber to create a new type of concrete that transmits light. 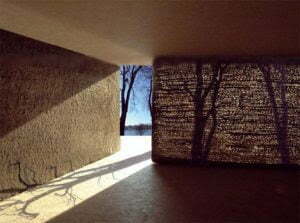 A wall made of Light-Transmitting Concrete allegedly has the strength of traditional concrete but thanks to an embedded array of glass fibers can display a view of the outside world, such as the silhouette of a tree, for example – Shadows on the lighter side will appear with sharp outlines on the darker one because of thousands of optical glass fibers form a matrix and run parallel to each other between the two main surfaces of every block.